IREDA Tax Free Bonds Jan 2016 Issue: Should you invest? 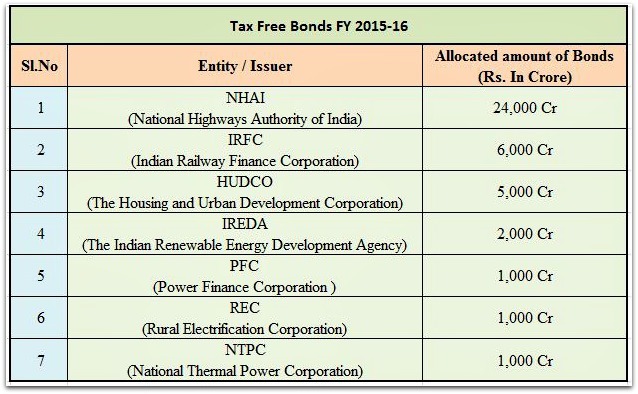 For the last few months, state-run companies like NHAI (National Highways Authority of India), NTPC (National Thermal Power Corp), PFC (Power Finance Corporation), REC (Rural Electrification Corp) and IRFC (Indian Railways Finance Corp) have come up with Tax Free Bond issues. All these issues have been oversubscribed. IREDA Tax Free Bonds is the latest issue which is going to be open for subscription from 8th January, 2016 to 22nd Jan 2016. Several state-run companies raised Rs 30,000 crore through tax-free bonds in FY12, Rs 25,000 crore in FY13 and Rs 50,000 crore in FY14. These funds are utilized to fund infrastructure projects. Let us first understand, what is a Bond? A bond is a Fixed Income security (debt investment) in which an investor loans money to an entity (typically corporate or governmental / PSUs) which borrows the funds for a defined period(tenure)of time at a variable or fixed interest rate (coupon rate). Those bonds which are exempt from taxation on the ‘interest income’ under the Income Tax Act, 1961 are called Tax-free bonds. These are usually issued by government-backed entities. Indian Renewable Energy Development Agency (IREDA) was incorporated in Mar 1987 as a Public Limited Company under the companies act and was set up by Government of India to promote, develop and extend financial assistance for renewable energy and energy efficiency projects. For six month period (Apr 2015 to Sep 2015) and the fiscal 2015, 2014 & 2013, company’s profit after tax (PAT) was Rs 148 crore, Rs 271 cr, Rs 240 cr and Rs 202 cr respectively. Bonds Issue opens on : 8th Jan, 2016. Issue closes on : 22nd, Jan, 2016. Issue size including over-subscription: Rs 1,716 crore (max). The size of the issue is small when compared to NHAI’s last issue of Rs 10,000 crore. Face Value : Rs 1,000 per bond. What is the minimum application size? : 5 bonds (Rs 5,000) per individual and in the multiple of 1 bond (Rs 1,000) thereafter. What is the maximum application size? : The maximum amount that an individual can apply is Rs 10 Lakh (Retail Category). Allotment is done based on ‘first come first serve’ basis. These instruments are classified as Tax free, secured, redeemable and non-convertible bonds in the nature of debentures. IREDA Tax-Free Bonds will be issued either in Physical or Demat mode. NSDL and CDSL are the depositories to the Issue. On 20 year duration bonds the Coupon rate offered is 7.68%. Interest income earned on Tax free bonds is exempted from taxes. Since the interest income on the bonds is exempt, no Tax Deduction at Source (TDS) is required. Although, the interest received on TFBs is exempted, the investor would still be required to disclose it in his/her Income Tax Return as an ‘exempted income’. Tax free bonds are not eligible for deduction under section 80c. Are Capital Gains taxes applicable on Tax free bonds? – Though the interest earned on these bonds is tax-free, any capital gain from sale in the secondary market is taxable. If you sell your Bond for a price that is more than the cost then you would have to consider this as a capital gain. Short-term capital gains from sale of tax-free bonds on exchanges are taxed at your income tax slab rate, while long-term capital gains are taxed at 10% without indexation. It is advisable to follow the principle –Think beyond taxes when investing. Do not invest in Tax-Free bonds just because the interest income is tax free. Your investment should match your financial goals requirements. If you have time on your side (young or have long-term goals), equity oriented investment avenues (shares, mutual funds etc.,) are the best bets to realize your financial goals. If you are in 10% or 20% income slab rate, it may be prudent to ignore TFBs. The interest earned on bank FDs and other types of bonds are not exempted from income tax. It is added to your income and is taxed as per the income-tax slabs. As interest earned from tax-free bonds is not taxed, investors in higher tax brackets mostly earn a better post-tax return than from FDs. But remember, the bank FDs score over tax-free bonds in terms of liquidity as these bonds have longer maturity tenure. Invest in this issue only if your income tax slab rate is at 30% and you want a steady source of income periodically over a long-term. Also, consider investing only a small portion of your savings towards these bonds. Do you think one should invest in Tax free bonds? Kindly share your views and comments on IREDA Tax Free Bonds 2016 issue. Any word on 2017 tax free bonds? Also, any past bonds available with discount in secondary market? Dear Cvan .. As of now no notification on TFBs in this FY 2016-17. Kindly check the bond prices..click here..